From the very beginning of its two-decade run on radio, Suspense was tops in thriller entertainment! Its first year on the air brought together stories from such outstanding masters of the genre as John Dickson Carr, Dashiell Hammett, and Edgar Allan Poe! 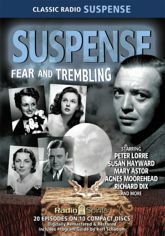 Tune in to twenty tense classics from Radio's Outstanding Theatre of Thrills - starring Peter Lorre, Mary Astor, Susan Hayward, Richard Dix, Lou Merrill, Agnes Moorehead, Frank Readick, Alice Frost, and more. Includes a Program Guide by Karl Schadow.